Posted By:Unknown | At:6:48 AM Be the first to comment! We can now add another name to a list of black politicians who's found themselves on the other side of the law after allegedly being caught with their hands in the cookie jar. The mayor of Charlotte, N.C. can now add his name to a list that includes Kwame Kilpatrick, Rep. William Jefferson, and Ray Nagin. 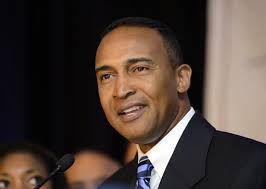 Patrick Cannon, who rose from public housing to become mayor of North Carolina’s largest city, was arrested Wednesday by the FBI and accused of accepting tens of thousands of dollars in bribes – including $20,000 in cash delivered in a briefcase last month to the mayor’s office. But after arriving, Cannon learned who they really were, a source confirmed: undercover FBI agents who’d been recording their meetings over the past three years, long before he launched a campaign for mayor in 2013. Cannon resigned as mayor Wednesday night, capping an extraordinary day that included allegations of an illicit trip to Las Vegas and payoff negotiations at the Capital Grille – the same uptown steakhouse that figured in the region’s last major political scandal. It was there that former N.C. House Speaker Jim Black of Matthews, also a Democrat, took bribes from a group of chiropractors seeking help with legislation. Cannon was charged with theft and bribery, accused of taking cash payoffs at least five times. He was brought before U.S. Magistrate Judge David Keesler, required to surrender his passport and released on $25,000 unsecured bond pending an indictment that could come as early as next week. Prominent Charlotte attorney James Ferguson has been hired to represent him. Historian Jack Claiborne, who has researched Charlotte’s mayors, said such corruption charges are unprecedented in the city’s history. FBI agents with search warrants swept into the mayor’s office Wednesday, his home on Cumnor Lane in Ballantyne and his offices at E-Z Parking Inc. at 312 W. Trade St. They seized financial records, phones, computers and other electronic devices. They were also searching for a leather briefcase that agents say they stuffed with cash for the February visit to the mayor’s office. If convicted on all charges, Cannon faces up to 50 years in prison and $1.5 million in fines.